Paul Whipp's Henrys deer taped out at 32 1/2" wide and scored 182". Dreams are supposedly just that, dreams. Do they come true? Well, given enough time they might just happen. 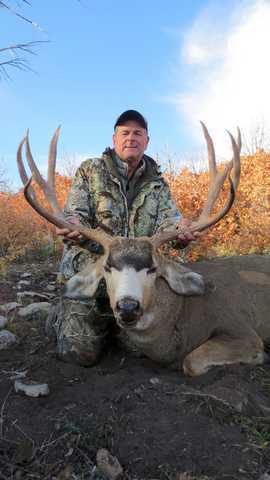 We all have admired the displays and photos of the huge bucks in the outdoor magazines and on the walls and have done a little wondering and dreaming. Let's go back 24 years to June, 1989 when I received a letter from the Oregon ODFW congratulating me on drawing a California bighorn sheep tag for the East Owyhee unit. 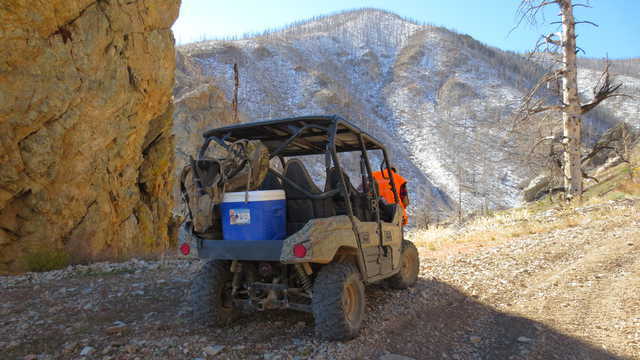 On arriving at the Leslie Gulch campground with my friend David Cooper we introduced ourselves to the only other campers, and found out Elvin Hawkins' group was guiding a non-resident sheep hunter. Naturally, our conversation immediately turned to sheep. Thus, Elvin had begun to mentor me, unknowingly to both of us at the time, in my journey into the exciting field of trophy hunting. 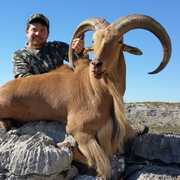 Following my successful taking of a ram I spent the next 20 years doing the do-it-yourself or DIY without much success; the results were mostly only smaller bulls and bucks, as trophies were only a bonus if they were to luckily appear. Oregon's opportunities for trophy hunting were steadily in decline due to numerous factors, and I will leave the reasons why to others. Then in 2010 things began to change; I drew a Steens Mountain mule deer buck tag. I called Elvin, and he suggested to me that if I was serious about taking a trophy quality buck that I should hire a guide. I went with the best guide known on the Steens, Chuck Messner. Although we did not have any opportunities for taking a trophy buck my education into trophy hunting and my learning curve was just beginning. Also, I began using Elvin and Nancy, who run Spot Country Application Service, for help in my deer and sheep applications. One day this last spring I noticed a $168 debit from my bank related to Utah DNR. So, being a little puzzled, I called Jake Bess of Timber Mountain Outfitters about this, and he told me that "almost certainly" I drew the Henrys tag, but added a word of caution: that one year the game department had over-subscribed and had to recall some of the tags. So the waiting game began until the day when I actually received the Henrys tag in my mailbox. Needless to say a few calls had to be made following this very happy moment. The first important call was made to Ryan Hatch at Muley Crazy. I had met Ryan a few months earlier after chasing mountain lions East of Kanab with Jake. Ryan gave me the name of Rusty Hall, owner of Offgrid Outdoors. However, Ryan mentioned that either Jake or Rusty would do a good job of guiding for me. I called Rusty and he said he might be guiding a non-resident but to keep in touch. I indicated to Rusty that I was definitely interested. In phone conversations with some other guides, generally they told me experience was the key to success on the Henrys. 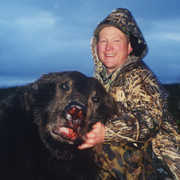 I called Rusty back, got more details, booked the hunt with him and dropped a check deposit in the mail the following day. After arriving in camp on Thursday evening prior to the Saturday opener we saw some videos that Wayne Brown [my spotter] took while scouting during the summer and during the archery and muzzle loader seasons. All of us were zoned into hunting this buck called "Racer" on the first day. There were lots of other helpers and hunters in Racer's domain along with tons of vehicles on the roads. We found out that another guided hunter killed the Racer buck. We had been seeing from 15 to 20 average bucks every day. One particular interesting buck had a hooked cheater, some extras and long main beams. After a difficult decision I did not want to shoot him, rather I would try for something better. Another hunter named Luke killed him the next day. As his crew passed our camp the buck was indeed a good one; and after seeing his buck I had no regrets in my decision and was happy for the hunter. After seeing only a few good shooters that might gross out in the 190's, Rusty asked me what particular type of buck I really wanted. I said, "A typical that is high, wide and handsome." At the time, I had a vague idea, but still could not tell you what a famed 200-inch Henrys buck would look like. And besides my old eyes and supposedly "high-end optics" were giving me fits. So, with that in mind we set off to an area we had not previously been over, as all the good bucks were getting shot, and our options were running out. On Wednesday evening, Wayne Brown and Chance Amador spotted a couple of good bucks, one a non-typical and another that was a huge typical. Even with my inferior backup binoculars I could see the typical had a wide rack. Prophetically, Chance said, "One of these bucks will die tomorrow." So, Thursday morning we were up before Wayne's sick chicken sounding alarm went off. Wayne suggested that I pack light on the stalk up the hill. Even after the "Hawk's" famous line of "Travel light, get close and shoot straight" we still shaved off about another four pounds. After a moonlit trek up the ridge we were able to start glassing for the buck we wanted. Soon Wayne found him, got out the spotting scope and confirmed it was the buck I wanted and then we had the rifle lying on a pack and resting on a downed tree. Because I had trouble seeing the buck, Wayne was very helpful to me in finding and staying on the right buck. My shooting affair turned out to be a "rodeo" of sorts as I missed high my first shot, hit him too far back the second and finally put him down for keeps on the third one. Wayne was the first over to the buck, and yelled back at me and said, "Paul, I'm sorry to say he won't go 30 inches……a pause……he'll go over 32." Then my legs really started to shake. When I came upon him my mouth just froze for a moment…..holy moley, what a tremendous buck! He was an old buck and may have peaked at his prime in another year. Wayne mentioned that if the moisture on the Henrys had been higher this year, his main beams would have lengthened and may have went into the book. Nevertheless, he is a fantastic buck no matter how the future score goes. After the picture taking, the meat quartered and the trophy caped we backpacked down to the truck. I would like to express a tremendous sense of gratitude to Rusty, Wayne and Chance and others for helping me get that "high, wide and handsome" buck of a lifetime. What an enjoyable, fun and memorable Henrys Mountain hunt. A display of this old monarch, a very exceptional, beautiful buck will be a constant reminder that dreams do indeed come true.